It’s a battle for best value. Both machines deliver more for the money but who comes out on top? You may be surprised. Bread machines that are loaded with options and features typically cost more than $200. Here are two that cost less than that and offer numerous features you would find on more expensive machines, but is one better than the other for the money? 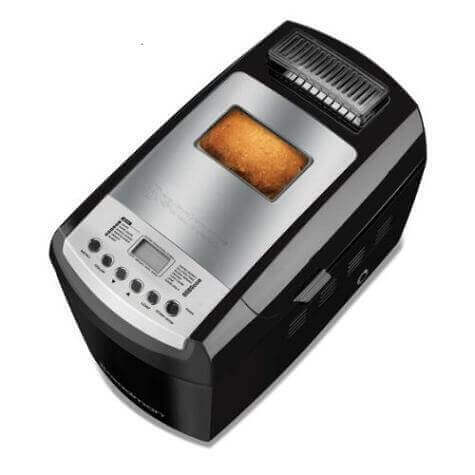 To begin with, the Breadman BK2000B has some features not offered on the Cuisinart CBK-100. The Breadman features a horizontal loaf; the option to bake two 1-pound loaves at the same time, and collapsible kneading paddles. 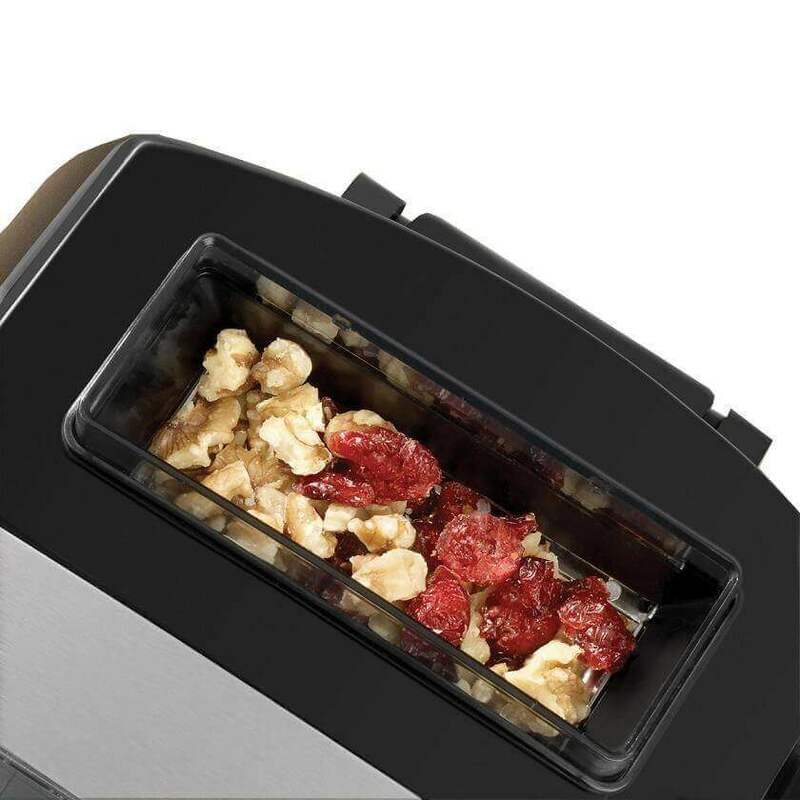 The Breadman also offers an automatic fruit and nut hopper. 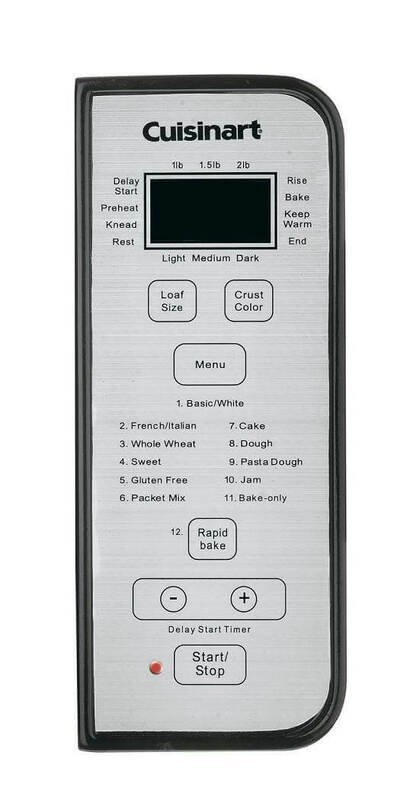 In addition it has all of the features of the Cuisinart and the Breadman costs $145. While the Cuisinart bakes only a vertical loaf with a single, fixed paddle and does not have a fruit or nut hopper it may be a better value for the money at $122 even though it doesn’t have the dual, collapsible paddles or the fruit and nut hopper. The reason why is related to the large number of owner complaints about, you guessed it, the collapsible paddles and the fruit and nut hopper. Some other bread machines promise collapsible paddles. 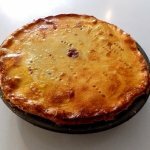 The benefit is that a collapsible paddle will collapse after kneading and leave a smaller hole in the bottom or the baked loaf. The problem is that the collapsible paddles on the Breadman often don’t collapse. In fact these uncollapsed paddles seem to leave an even larger hole in the loaf than a fixed paddle. To make matters worse, there are times when the paddle stays collapsed even during the kneading cycle. This is a total fail and many owners reported this problem. Another problem is related to the automatic fruit and nut hopper. Owners report that fruit tends to stick to the sides and doesn’t empty into the bread pan. This is also a common lament with other machines with fruit and nut hoppers. The fastest fix is to dust fruit like raisins with flour. This will prevent the fruit from sticking to the sides of the hopper. As the chart below illustrates most of the features are identical if not similar. We’ll highlights some differences, advantages and disadvantages in notes at the end of this comparison chart. These are both big machines. The Breadman is one of the heaviest bread machines topping out at 24 pounds. The Cuisinart isn’t far behind at 22 pounds. This typically isn’t a problem because most bread machine owners keep their bread machine in a fixed location on a kitchen counter. If you’re planning to store the machine in a cabinet or pantry between uses, both of these machines might be too heavy for regular relocation. A reported advantage of a heavier machine is that it’s less likely to wobble or walk on a counter top during the kneading cycle. Some other machines in lighter weights have been reported by their owners to have this problem. The Breadman is also very long at 27 inches. This is to accommodate the horizontal bread pan and the control panel. The Cuisinart is a bit more compact in size so if counter space is at a premium you might want to take that into consideration. If you prefer a horizontal loaf like you get at a bakery or grocery store than the Breadman could be your choice. The Cuisinart bakes a standard vertical loaf. 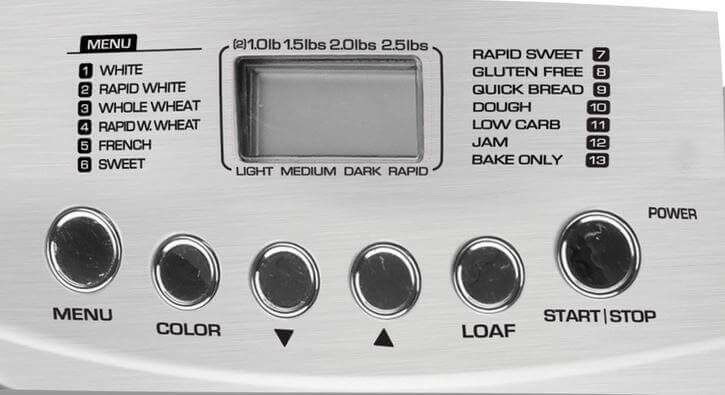 The Breadman will also bake up to a 2.5 pound loaf while 2 pounds is the top limit for the Cuisinart. 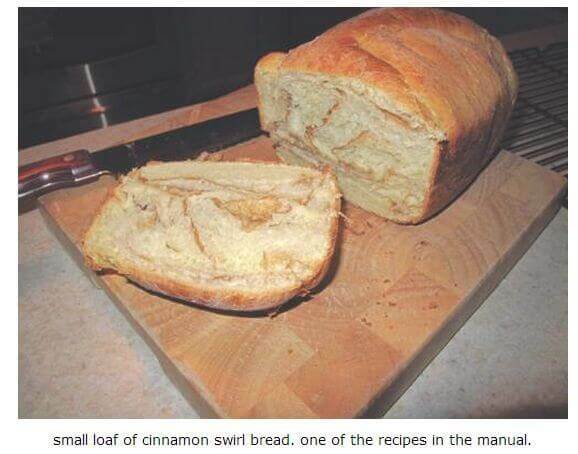 All bread machines that can bake a horizontal loaf can bake up to 2.5 pounds. 2 pounds is the limit for any vertical loaf machine. Both loaf pans are Teflon coated. The Breadman comes with 3 loaf pans. One large horizontal pan, and two smaller, 1-pound pans that bake vertical loaves. The Cuisinart has a single vertical pan. 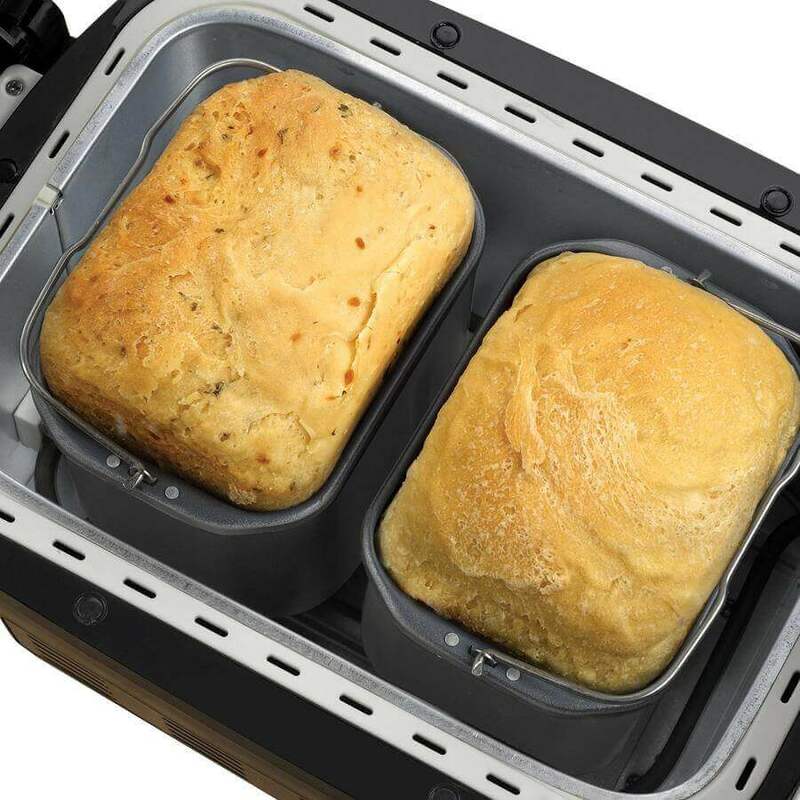 If you like the idea of baking two 1-pound loaves at the same time you might want to consider the Breadman. Both machines have 13 settings from white bread to 100% whole wheat to gluten free. They have 3 crust colors from light to medium to dark. They match up with viewing windows in the lid and also match up with a problem. There were owner complaints about both instruction books. This is an unfortunately common complaint with many bread machines. However, the Breadman not only provides a poor instruction book, but many of the recipes were blatantly incorrect including a report from one owner that the yeast in a 2 pound recipe was measured in cups rather than teaspoons! There also seem to be occasions where Breadman owners didn’t receive an instruction book, or were told to download it from the Internet. The Breadman BK2000B comes with a 2-year limited warranty while the Cuisinart CBK-100 comes with a 3-year limited warranty. That’s somewhat unique in both instances given that most bread machines only carry a 1-year limited warranty. Another unfortunate matchup is support. Both machines appear to offer weak support based on customer ratings, but the Cuisinart received slightly better scores. The Cuisinart CBK-100. At first it seemed like the Breadman BK2000B had a clear advantage on features even though it’s priced higher than the Cuisinart CBK-100. But problems with the Breadman’s collapsible paddles, support, and its erroneous instruction book offset the advantages of its horizontal and/or two vertical loaf configurations. The Breadman also has a shorter warranty period than the Cuisinart. The fruit and nut hopper problem with the Breadman really isn’t a big issue because all machines we’ve reviewed with fruit and nut hoppers show the same problems with fruit sticking in the hopper. A dusting of flour fixes the problem and is the best solution. And finally there’s price. The Breadman is about $20 more than the Cuisinart. If the collapsible paddles worked and the instruction book was first rate it would be easy to recommend the Breadman over the Cuisinart. 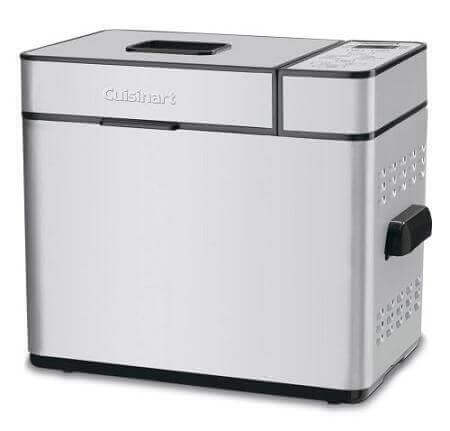 Until Breadman comes to terms with those issues the Cuisinart is the best overall value for the dollar across all bread machines we have reviewed to date.